In her new essay collection, the beloved author of High Tide in Tucson brings to us from one of history's darker moments an extended love song to the world we still have. From its opening parable gleaned from recent news about a lost child saved in an astonishing way, the book moves on to consider a world of surprising and hopeful prospects, ranging from an inventive conservation scheme in a remote jungle to the backyard flock of chickens tended by the author's small daughter. 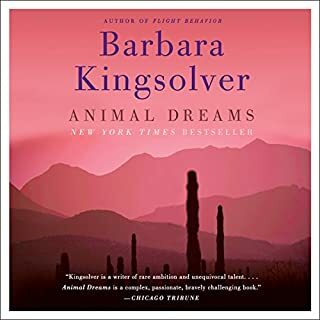 Barbara Kingsolver has written these five short stories with the same wit and sensitivity that characterize her highly praised and beloved novels Animal Dreams and The Bean Trees. Spreading her characters over a variety of colorful landscapes, she tells stories of hope, momentary joy, and powerful endurance. Another great book by Kingsolver! When Barbara Kingsolver and her family move from suburban Arizona to rural Appalachia, they take on a new challenge: to spend a year on a locally-produced diet, paying close attention to the provenance of all they consume. Animal, Vegetable, Miracle follows the family through the first year of their experiment. They find themselves eager to move away from the typical food scenario of American families: a refrigerator packed with processed, factory-farmed foods transported long distances using nonrenewable fuels. In their search for another way to eat and live, they begin to recover what Kingsolver considers our nation's lost appreciation for farms and the natural processes of food production. Americans spend less of their income on food than has any culture in the history of the world, but they pay dearly in other ways: losing the flavors, diversity, and creative food cultures of earlier times. The environmental costs are also high, and the nutritional sacrifice is undeniable: on our modern industrial food supply, Americans are now raising the first generation of children to have a shorter life expectancy than their parents. Part memoir and part journalistic investigation, Animal, Vegetable, Miracle makes a passionate case for putting the kitchen back at the center of family life and diversified farms at the center of the American diet. I really enjoyed listening to this book. I'm actually glad that I listened to it instead of reading it--I think listening forced me to slow down and really absorb everything the book says (I tend to read pretty fast). The juxtaposition of the different voices of the authors (Barbara K., Stephen H. and Camille K.) worked very nicely. Some of the points do get repeated a bit throughout the book, which did get a little annoying. However, that did not interfere with my enjoyment. The book struck such a chord with me. When I was a child, there wasn't so much transportation of produce and I do remember how excited my mother would get when certain things came "in season." This book really brought all that back. I wish I had read this book in August or July, instead of November! I also appreciated the insight into the corporate food industry. The book makes me want to investigate further. Totally enjoyable and informative! Wasn't sure I wanted to read another book about food and organics, but I'm very glad my friends encouraged that I do so. I didn't particularly enjoy the author's personal narration. As a gardener, food preserver and one who cares greatly about nutrition and good eating, it was very good. As one who owns and loves animals, the chicken and turkey tales were great. 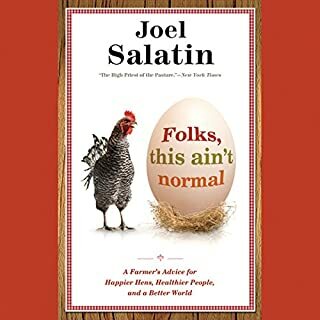 Don't miss this book if you care about food sources and learning how easy it is to prepare good food - and how this family did it. Since reading this book I can't reach for a pepper at the grocery store without wondering where it came from, how many miles it traveled, or how it was grown. In fact, I only buy my produce from my local farmer's market and am learning to eat seasonally. How and what I eat hasn't been the same since finishing this book - Barbara Kingsolver invites an intellectual conversation back into the American diet, after decades of forfeiting our knowledge about what's in our food over to the food processing plants and agricultural system. In our hustling bustling lives of today we must learn to take pause and give more thought to what gets us through day by day - our food. This book is a great way to stimulate how you think about what you eat and your relationship with food. 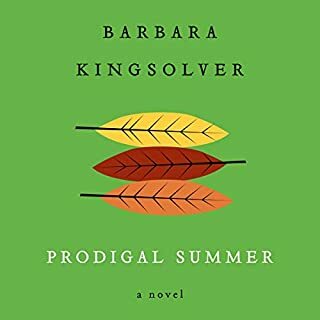 Kingsolver's self narration of her book is charming and one of the best I've heard. If you enjoyed Michael Pollen's "The Omnivore's Dilemma" you'll love this book even more. I had just finished reading "Cooked" by Michael Pollan, so I downloaded this book which had been on my wish list for a while. 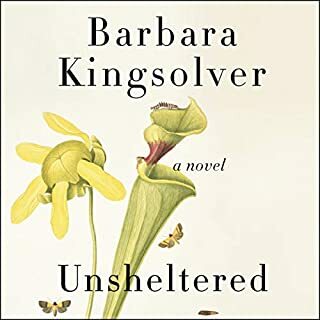 I also recently listened to "Flight Bahavior" and really liked Barbara Kingsolver as the narrator. I was immediately pulled in to the narrative of their year of eating deliberately. I felt really inspired, and realized I was ready for this book. Some people found its tone a bit preachy, but it appealed to me because it just made so much sense, as did "Cooked." I started buying nearly all my meat, dairy and produce from our Saturday morning farmers market, and whole wheat bread from a local bakery, as Pollan suggested. I just finally got that Big Agribusiness doesn't much care how healthy and environmentally responsible the products they produce are. A supermarket tomato sold in February is inedible and buying it is just dumb. I'm trying not to bore my friends and family; my daughter gives me the eye-roll. I've started to really enjoy meal planning and cooking, and for those of you who are ready for this message, read this book! This was my first audio book on audible. I LOVED it. I am very picky about my narrators, and the fact that it was the author herself made it that much better. I have the print version of the book but I just could not get into it like other Kingsolver books. So I downloaded the audio version and I can't stop listening! After I finished I just started it again! This book is so inspiring I would look for any recommendations of books just like it. Kingsolver's words are just so poetic that it makes you wish you were there with her canning tomatoes, working in the garden, hunting in the morel patch. I am kind of disappointed that my first audiobook was such a success, because now it is going to be hard to top it. Listening to this is like getting teeth pulled. Would you try another book from Barbara Kingsolver and/or the narrators? 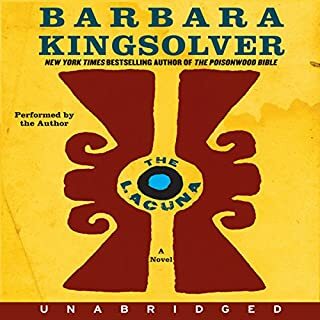 If you’ve listened to books by Barbara Kingsolver before, how does this one compare? I'm on chapter 14 and I tried, I really tried to get thru this book. My sister really loves it, and I'm a nonfiction fan, but I can do without the flowering metaphors and the deadpan mom jokes, especially with the agonizingly slow pace that she reads at. Some authors shouldn't read their own books -countless times I've realized that I stopped listening an hour ago because it's way too easy to drown her out with literally any thought. The super random farm sound effects between the chapters are not needed either -they just waste time. Was Animal, Vegetable, Miracle worth the listening time? The story itself is really interesting, and I like when her kids read some of the parts, but I just don't think I can take another chapter. All in all I DO want to start focusing on buying and cooking vegetables according to season and reducing my carbon footprint by keeping up my garden. The story is there somewhere buried underneath the fluff, but it's the fluff that eventually did me in and made me give up. If the above performance sounds like something you can stomach, then yes, I'd say it's worth a listen. 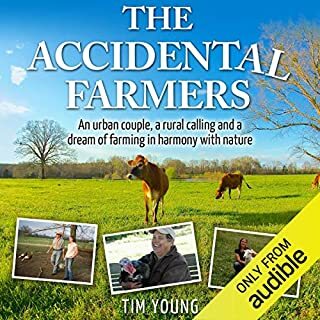 I gave this audio book 5 stars for the reading, the content and humor along the way. At times, some of the content was too preacher-like and demeaning to the intelligence of common folk. I have overlooked these areas because the overall approach of becoming aware is the most critical part of the book. It certainly takes a cold-turkey jump into buying locally to really appreciate all we (technologically advanced countries) have taken for granted. While not everyone needs to follow her footsteps, it was the learning curve needed to be able to share this topic with others. So, if you like to be respectful to the Earth, but you won't scream at the woman wearing a silk blouse, or berate the cowboy for wearing leather boots, then this book should be enjoyable. As with all audiobooks, which is very different than a physical paper book, the reading is the key. The book was read by the author, her husband and daughter, and the tone was pleasing. I could not have finished this book if the author were to have read with a hell, fire and damnation tone. For this reason alone, I give 5 stars! Animal, Vegetable, Miracle is an interesting story of a year-long experiment with eating wholesome, locally grown food, eliminating almost all foods coming from another state or region. There is much to be learned from their experiment. This is also a good read. Kingsolver tells a tale well, whatever the tale. 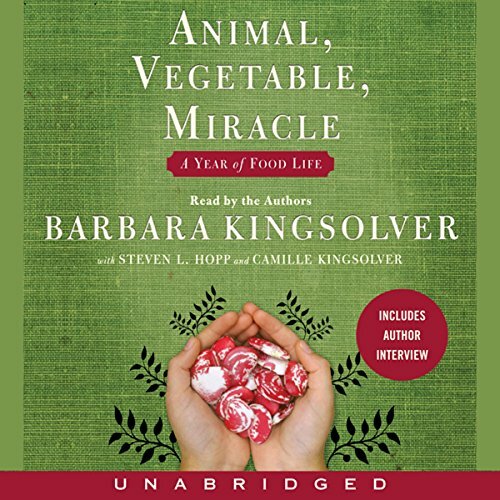 Barbara Kingsolver and her family created an excellent memoir of their experiences becoming more acquainted with their food lifestyle. The story is compelling, entertaining, and inspiring. I'm ready for change and this book helps show how easy it is to become more in control of your health and nutrition just by selecting food based on the real costs to our environment and our lives. A must read for anyone interested in a healthy, environmentally sustainable life-style.